Woodland management was one of our major activities. We worked with private woodland owners, woodland investment companies, local & district councils and wildlfe & conservation groups. Our woodland management aims and experience was geared around the principles of sustainable woodland management in order to maximise output and profit long-term whilst ensuring and developing wildlife conservation and increasing biodiversity. We were well used to the challanges and considerations required when undertaking work in SSSI (Sites of special scientific interest) and generally sensitive environments. Here, in particular, any woodland management activities had to include a consideration of the other species present and the woodland as a whole. In days gone past many woodlands would have had resident local woodsmen. There are advantages to having local woodsmen who have a knowledge of the woodlands and who live in them. One of the main advantages is timing. The British weather is capricious at the best of times and nature does not do dates. A woodsman within the woods can adjust daily activities to suit. 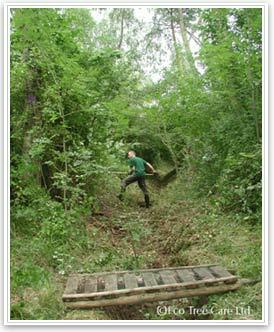 Coppicing or pruning during heavy frost or too late can be detrimental to the coppice stool. Wildlife use different areas or migrate at different times of the year. Flora grow in different areas at different times of the year, at times their presence may be undetectable. A woodsman working an area of woodland would know where the badgers are, where the tawny owl is nesting, which trees have winter bat roosts, which areas get wet and be able to time timber extraction accordingly. A woodsman will know after a long dry period in the spring that he may need to check on newly planted trees, it may be hard work but just one watering and application of some mulch may save many trees that could save much more work in the future. A woodsman will, over time, develop a relationship with woodlands that allows him to maximise the outputs without destroying habitat, but instead enhancing it. By contrast employing gangs of foresters to come in who have no direct connection with the woodlands can lead to damage because it is too wet or cold, they will not know where the owl or bats are roosting and may not even care. But with careful supervision and good communication it is possible to work effectively with outside contractors. 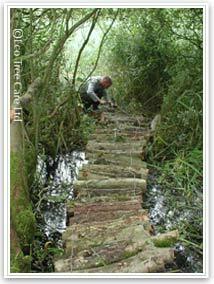 It is a great advantage to have a local woodsman who knows the land between the woodlands and the contractors. Opening up new tracks into amenity woodland allows owners, families and schools to gain access deep into their woodland. 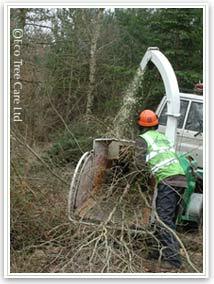 In commercial woodlands it gives access for timber and products extraction. 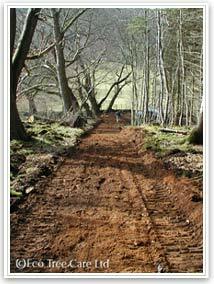 Tracks also serve to add 'edges' to woodland. By allowing light in and managing the species along tracks and rides, perhaps with additional planting, it is possible to create niches habitats that can dramatically increase the biodiversity of woodlands. Ditches can bee seen like the arteries and veins of some woodlands and the maintenance of ditches to keep them free flowing can be of the up most importance to the health of the woodland. Depending on the particular site water needs to freely drain from woodlands so they do not become waterlogged. If the ground becomes too wet then the health of the trees can be undermined and in serious cases can lead to 'wind throw' where trees unstable in the wet ground are blown over by high winds. Once an area of wind throw has started there can be a domino effect passing through a woodland. This happens where adjacent trees which have grown with the shelter of other trees are now exposed to the full force of the wind and suffer wind throw themselves, and so on. In overgrown woodlands that have received no management for a long time it is also an excellent way of penetrating deep into a woodland and opening it up to discover what exists and serves as a first point of surveying and mapping. Keeping ditches clear is a simple enough operation, but requires effort and the right tools. We have found from experience that it only takes a relatively small fallen branch to lead to a build up of debris and eventually to a serious dam blocking up the free flow. Keeping ditches clear is animportant woodland management consideration, especially pre-winter. In some cases it may involve bringing in earth moving machinery to resculpture the ditch or creating additional new sections. Coppicing is an ancient form of sustainable woodland management which makes use of the ability that some trees have to regenerate themselves when they are cut. In this system the tree is cut to ground level in the winter months and then left to regrow. When it reaches a harvestable size it is recut. This continual cutting creates a low cut stump that regenerates, known as a 'Coppice Stool'. 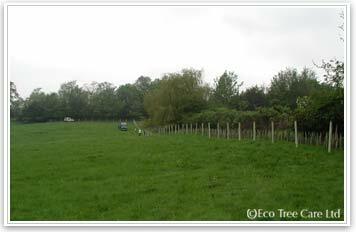 The coppice is re-cut on a 'cycle' or 'rotation'. The idea is that woodland areas, known as 'cants' or 'coups' are cut sequentially. The number of these areas being the time in years for the trees to reach a harvestable size so there is always annual produce. 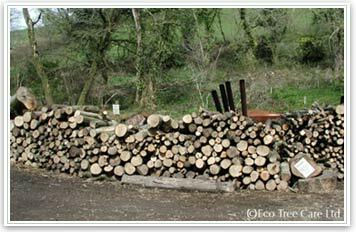 It provides the understorey in a woodland and is a regular and sustainable source of timber when managed properly. 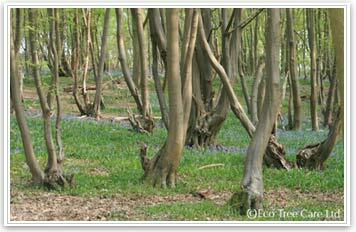 The most common trees to be coppiced are hazel, hornbeam, sweet chestnut, oak & willow. Coppice is a major type of woodland in Britain, which on the whole has unfortunately been left without management since the second world war. The result is that much of our coppice woodland is desperately in need of re-cutting in order to preserve its integrity and maintain its overall health. We are at a stage now where some of the coppiced trees are falling apart and so falling over. As time goes on the ability of overstood stools to regenerate diminishes and often upon cutting they may die completely. The woodland will then require re-stocking. Coppicing is also important for biodiversity in woodlands as the system means that there is a range of different tree ages and heights across the whole woodland, with all the diversity of wildlife that comes with this variation. Where trees have been managed for timber the standard activities of felling and thinning are part of the management plan. Selective felling is undertaken to carefully remove trees ready for timber conversion , we have a Peterson Portable Sawmill for onsite milling if conversion is required on site. This can help reduce extraction costs and damage. Sometimes it is the only viable option for extracting timber from difficult sites. 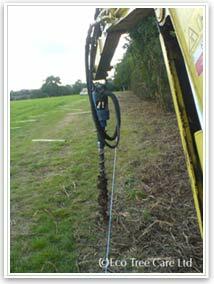 Selective felling is also carried out where there is a need to fell for creating clearings or ponds, or for health and safety reasons. Thinning - When woodlands are planted the young trees are closely planted so they compete with each other and 'draw' each other up towards the light. This encourages straight growth. As the trees grow older thinning takes place periodically. The purpose is to selectively remove poor specimen trees and/or to give more space and light to those with a greater potential to grow into fine mature trees. The amount of thinning must be carefully considered. Over-thinning can lead to the phenomena of 'Windthrow'. Trees as they grow seek to equalise the stresses and strains across the whole of their structure, only putting on extra woody growth in the areas required to 'engineer' a strong a stable structure. Where trees have grown up together they shield and buffer each other from their environment, collectively they are strong, individualy they are relatively weak. The act of woodland thinning removes neighbouring trees from around the trees to remain, therefore for a time these remaining trees are vulnerable to gusts of wind that can 'get into' the stand of trees. If the wind does get into a stand of thinned trees and starts to blow over vulnerable trees then effectively more trees are being thinnned and the result can be a 'Domino effect'. A lot of value can be lost if this occurs. Apart from our expeirience and knowledge of tree growth, we will also consider the topography of the location and the prevailing wind direction. Decisions can then be taken to thin less in some areas and thin more in others accordingly. 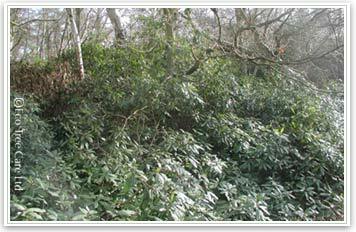 Invasive non-native species such as Rhododendron, Sycamore & laurel can become a challenge in any woodland if they are left to grow unchecked. Where shooting has recently been the main use of a woodlands, Rhododendron and Laurel were often planted to give cover to game birds bred in the woods . Or it may be that they have 'escaped' from nearby planted ornamental gardens. Whatever the case they can develop into a major problem with the eventual result in some cases being that the woodland becomes pure Rhododendron or heavily dominated by laurel. Sycamore is adept at setting seed and in some woodlands can develop to become invasive casting a deep shade under which few other species stand a chance. Rhododendron, although a beautiful flowering tree, becomes quickly invasive. It self-seeds and propagates by lateral branches spreading out and rooting. Rhododendron spreads out covering the ground with a deep dark shade under which nothing else can grow. The break down of its leaves acidifies the soil as it goes. In some cases removal of Rhododendron is something that can only be achieved by consistent effort over many years, especially if it has already become well established. There are woodland improvement grants available from the Forestry Commission to remove Rhododendron from woodlands, which is something worth looking into. It is definitely worth investing the effort to remove it in woodlands where nature conservation is the main aim. Rhododendron is also a vector species for the Phytophora 'Sudden Oak Death/Bleeding Canker'fungus. On the positive side Rhododendron makes excellent firewood and charcoal. It burns at a high temperature. 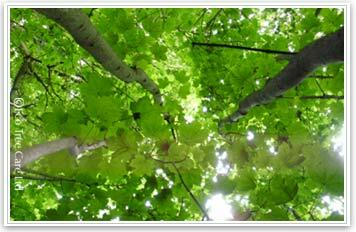 Sycamore is a technically non-native, however it has been on the British Mainland for many hundreds of years. Some consider it naturalised or as good enough native, it just depends how far you go a back in time. 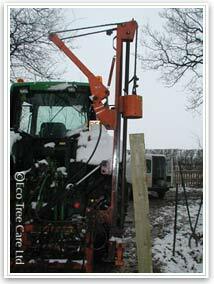 Sycamore does support a certain amount of wildlife and can be an important timber crop. When mature in a parkland setting they are magnificant trees. 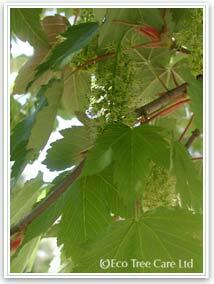 However, Sycamore seeds prolifically and these seeds self-set very easily. This means that in some situations it can become an invasive species. 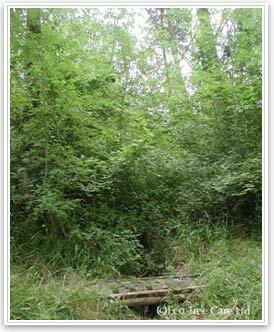 In woodlands when establishing under favourable conditions it can become over dominant. However it should be bore in mind that Sycamore is not a 'bad' tree. Having prolific Sycamore regeneration can be a good thing depending on the site. Sycamore could also be a good species to encourage to provide resilience in the face of climate change and or the spread of tree diseases. A characterisic of Sycamore is that it develops large leaves which can out shade other species, it also shade tolerant itself and grows quickly. It coppices easily and so if sycamore is to be removed then even cut stumps need to be treated or removed in order to prevent re-growth. 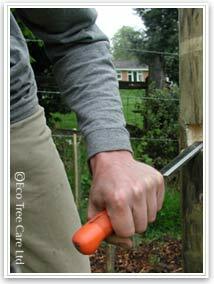 Small 1-2 year old seedlings can be hand-pulled, but after this they require cutting and treatment. Many woodlands have suffered from neglect over the last few decades, and for many of them woodland management often means replacing gates and repairing fencing. 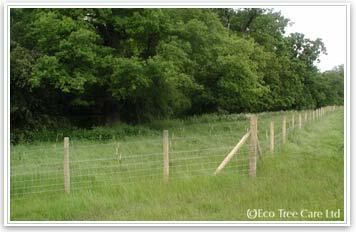 Gates are essential in some woodlands where damaging trespassing is taking place. i.e. Where, in sensitive woodlands, there is illegal 4x4 driving, motor bike riding, horse riding and problems caused by fly tipping. Fences of course mark boundaries and good quality fencing helps deter tresspasing and fly tipping, not only by creating an effective barrier but also psychologically giving the woodland a looked after feel. 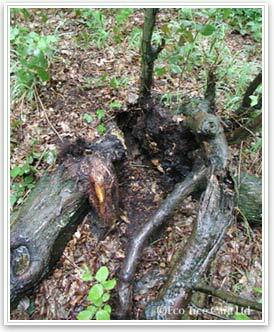 Deer can cause devastation in woodlands especially where there are newly planted trees or early coppice re-growth. This can happen where there are large winter populations or deer which strip bark from existing trees, or during the growing season they may graze on the leaves of planted trees, hedges and the new coppice shoots. One effective method of protection, other than keeping the population number down, is to surround areas to be protected with effective deer fencing. Similar problems can be caused by large rabbit populations. 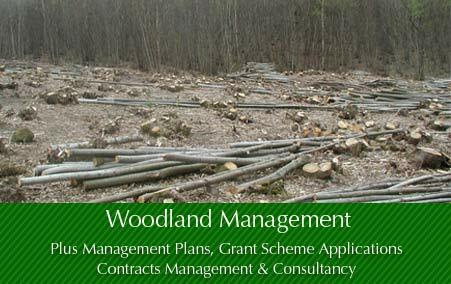 For new and existing woodland owners we offered the service of surveying and the creation of woodland management plans. Whilst surveying we cross referenced land registry plans with on the ground measurements of land marks and features. We looked at historic maps to look at past usage and give clues to features, past management and tree species and check the Statutory Designations and Habitat Inventories. We have surveying equipment ranging from 'Walktax' measuring, to laser distometers, to modern GPS satellite navigation mapping. These techniques combined with our experience of plotting and map reading means we can produce accurate maps of woodland areas. We also use computer software to calculate areas and plot lengths. We listened carefully to the woodland owner or estate manager to understand the requirements, intentions and time-scales involved in the proposed woodland management. Then using this information and the knowledge gained from the survey and the desk-top analysis we could produce a robust management plan which delivered the long and short term vision and intentions of the owners balanced with the restrictions and resources of the existing woodland. When we were dealing with new woodland owners our general advice is to do nothing major for at least for a year or two of new ownership, giving time to become familiar with the woodland. Which areas become wet in the winter - are new ditches required? Perhaps a pond to be created? What and where are the animals of the woodland - bats, badgers, foxes, deer, rabbits - a problem? What and where are the nesting birds - woodpeckers, birds of prey, song birds? Are there frost pockets, or areas that are particularly shaded? In order to organise and focus thinking about future woodland management plans we had devised a short questionnaire. It served as a first point of guidance to both woodland owners and to us.